“What marinade do you use?” is perhaps the most common question I get when people ask me about cooking venison. Truth is, I don’t always use a marinade – a really good piece of backstrap needs little more than fire, salt and maybe some black pepper. But there is most definitely a place for marinades in venison cookery. You just need to know when to break out your favorite marinade, and when it’s better just to make it a sauce you serve at the end. Marinades are acid-based (or occasionally enzyme-based) liquids or loose pastes that are used to infuse meat (or veggies) with flavor, while at the same time tenderizing them. At least that’s the theory. Bathing venison or any other meat in an acidic sauce (or with certain fruit juices like those from papaya or pineapple) will indeed break down some of the muscle tissues on the outer surface of the meat. The acid or fruit enzymes denature the proteins, making them actually a bit mushy, but we register this as tenderness when we eat it. What’s more, you should know that marinades cannot penetrate meats the same way salt-based brines do. According to most food scientists, a marinade cannot penetrate much deeper than 1/8 inch into a piece of meat, even after several days. The bottom line is that acidic marinades don’t tenderize meat, and those with raw ginger, pineapple or papaya juices just make the meat mushy. I can hear you saying, “But when I marinate venison roasts, they are absolutely more tender than when I don’t!” And you are right, but it’s not the marinade that is making your roast more tender. According to the great French food scientist Hervé This, long marinades do have an effect: “The meat is more tender,” This told the Washington Post. “But it is not the marinade that makes it tender: It is time. If you use an acidic marinade, it will protect the surface from spoilage while the rest of the meat matures. And you know when meat matures, it becomes tender.” This is the secret behind the long marinades in German sauerbraten, which can marinate for a week in the fridge. And marinades do impart flavor onto the meat’s surface. Even a few minutes’ worth of marinating time will give you some added flavor in the finished dish because the flavorful liquid soaks into any crevices and cuts in a piece of meat. Most importantly, marinating meat in an acidic sauce for at least 40 minutes has been shown by the American Cancer Society to reduce by up to 99 percent the amount of cancer-causing heterocyclic amines created when meat is cooked by a direct, open flame, i.e., grilling. This means a marinade not only improves flavor, but can also make that char-grilled piece of venison healthier. Because marinades can only penetrate a few millimeters into a piece of meat (at best), you’ll want to use cuts of venison that aren’t too thick. This means backstrap medallions from large deer, elk or moose, all leg steaks, flank steak, cubes for kebabs and so on. Or, go the sauerbraten route and marinate a large roast for a week or more. Just remember the acid in the marinade (don’t do this with the enzyme-based marinades! ), usually red wine, is just protecting the meat from spoilage, not actually tenderizing it. It’s the wet-aging of the meat for a week that does the trick. One thing a marinade will not do? Tenderize silverskin and connective tissue. You absolutely need to trim all this off before marinating because not only will it not tenderize, the silverskin will actually block the penetration of a marinade. You will want to marinate your venison in a sealable plastic bag, or in a covered, non-reactive container such as glass or plastic. Or you can vacuum seal it. Do this in the fridge to slow the growth of any bacteria. A tip: If you like stir fries and fajitas, marinate the venison slices before you stir-fry them. You’ll get more flavor that way. When you are ready to cook, take the meat out of the marinade and pat the meat dry with paper towels. Wet meat won’t brown. If you want to use your marinade as a sauce, you can do one of two things: Boil your marinade for 5 minutes before using it, or, if this will destroy your marinade (like chimichurri, which relies on raw, fresh herbs) make more than you need for the marinade and use the extra as the sauce. Do not just reuse the marinade you soaked the venison in raw: There is a chance, albeit small, that you might get food poisoning. Here are a few worth using. I’ll start with some that need no recipe. Italian dressing. Yep. The classic. Any sort of oil and vinegar dressing works fine as a marinade. Buttermilk. It’s acidic all by itself, and thick enough to use as the base to a batter or crust, the way you do with buttermilk fried rabbit. Citrus. Like orange juice or lemon or lime juice. Pretty harsh stuff, but it works if you don’t marinate too long. A few hours should do it. Soda. A Southern classic. Marinating in RC Cola or Dr Pepper or whatever is a thing. And it’s not terrible. Watch the sugar content, though, as it can burn on the surface of your venison if you are grilling over high heat. Worcestershire Sauce. More of a Northern classic, I like this one a lot. It’s a sauce and a marinade all in one. Worcestershire is also a hallmark of western Kentucky BBQ. Soy Sauce. More of a brine than a marinade, the salt level in soy sauce can be pretty severe, and it will darken your meat dramatically. Use only for an hour or so, or dilute it. 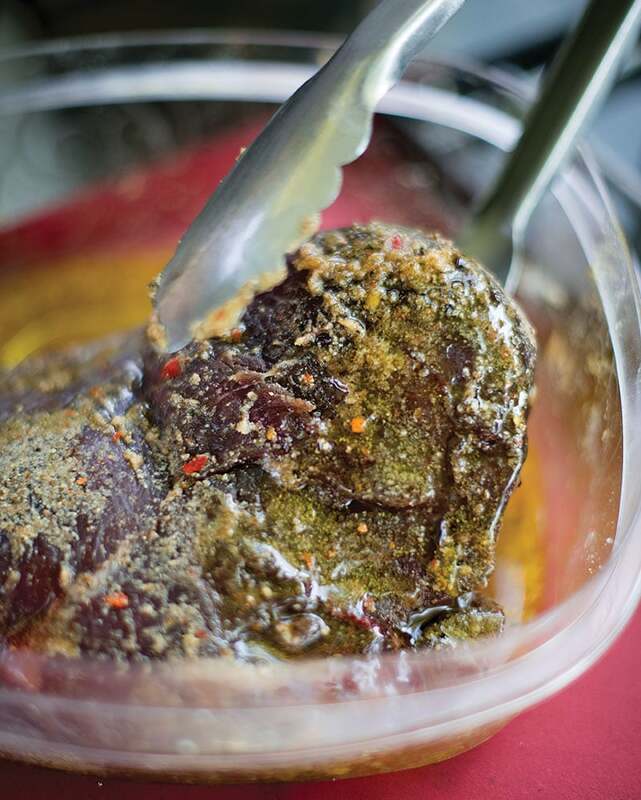 Here are a few marinades from around the world. All can be scaled up, and all are for about 1 to 2 pounds of meat. You can use store-bought teriyaki sauces, but I find them too sweet and too thick for a marinade. And if you make it yourself you can adjust the flavor to your liking. Just watch the sugar content, and don’t take it too much higher than what I have here, as too much will scorch. Mix together all the following ingredients before marinating. Bring all this to a boil, then cool to room temperature before marinating. This is a good summer marinade. Mix it all together and coat your venison with it. Buzz all this into a puree in a blender. Or you can mash it together in a mortar and pestle. This might be my favorite marinade of them all. I grew up with this one; my mom marinated flank steak in a version of this sauce. It’s sweet, savory and sour all at the same time. Buzz them all together roughly in a food processor. You don’t want this smooth. Great information and tips, Hank. Thank you for the common-sense information about high sugar content and it’s effect on browning. Many people forget about this. And you’re right-on regarding the salt content in pre-made (bottled) marinades, too. Many would make a cardiologist cringe! Love your work! So I did, thanks mate! !